Okay, this one is just for fun. My wife gave me this straight-to-video cartoon for Christmas and I must admit I enjoyed it. While not a laugh fest for those who do not appreciate slap-stick humor (I admit I do) it does have some good moments. In 2010 three well-known actors were talked into doing the voices for Sherlock Holmes, Dr. Watson and Prof. Moriarty. They were: Michael York as Holmes, Malcolm McDowell as Moriarty (McDowell is always such a great villain), and John Rhys-Davies as Watson. The plot is fairly simple (surprise), but clever. 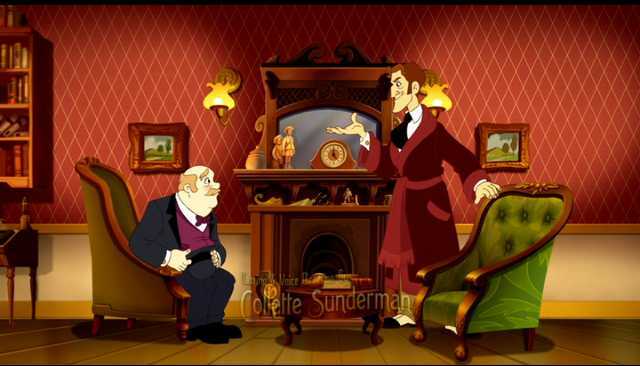 Watson informs Holmes of a jewel robbery that is the talk of the RATHBONE Inn. Holmes is interested but Tom has a message for Holmes from Miss Red who is a performer at the BRUCE NIGEL Music Hall. Miss Red is being blackmailed and Holmes deduces that her house is being used to tunnel into the museum to steal the “Star of Punjab”. (A la, the Red Headed League.) 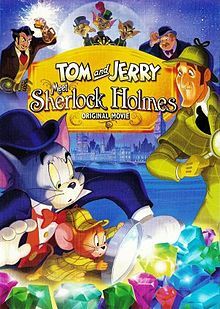 So, while Holmes and Watson go to see “BRETT JEREMY, a tailor in Lancashire,” Tom and Jerry must protect the fair heroine of the plot. 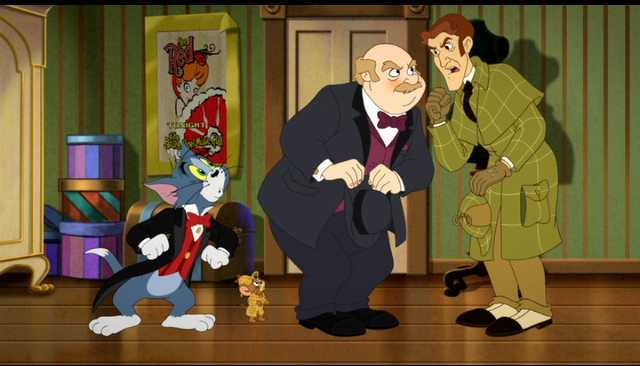 Of course Holmes and Watson are on a literal “wild goose chase” and it is up to Tom and Jerry to save the day. I won’t give away any more of the plot but I did enjoy the flying cats. It’s worth the 50 minutes of time just to take your mind off the issues of the day. Oh, and Grey DeLisle does the voice of Miss Red and has a catchy little tune, in her music hall routine, about how she prefers bumbershoots to men. Other Hanna-Barbara characters appear in supporting rolls such as: Droopy, Tuffy, Spike and Butch. John Rhys-Davies has a long history of doing voices for animation and in fact has a long running association with the Disney Company. 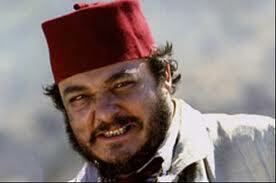 John Rhys-Davies is probably best known to the movie going world as the two time sidekick of Indiana Jones, Sallah. He is also famous for his part in the Lord of the Rings films. John Rhys-Davies has one of those voices that is unmistakable, you always instantly know who is playing the part, makeup or not. Rhys-Davies was born in Wales 5 May 1944. His mother was a nurse and his father a mechanical engineer and colonial officer. He grew up in England, Wales and Tanganyika and attended the University of East Anglia. After a short stint as a teacher he attended the Royal Academy of the Dramatic Arts. Besides the stage he has 207 film credits and has three movies either in pre or post production at this time. John Rhys-Davies is married but has been separated from his wife for many years. They had two boys, Ben and Tom. He has a daughter, Maia with Lisa Manning of TV. Rhys-Davies has a house on the Isle of Man where he likes to spend as much time as possible.